Floating candles used as centerpieces are extremely popular for many couples as they are elegant, tasteful, but most of all inexpensive. With most couples one of the first things they stress about is how much their decorations for their wedding reception will cost. With floating candle centerpieces, some of this stress is taken off their shoulders because they are so easy you can make them yourselves and save lots of money. There are many types of floating candles which are perfect for any wedding. Most common ones however are either white or cream and are typically round in shape. There are many others that are available including many varieties of floating flower candles which would be perfect if you are having an outdoor wedding. After you decide which candle type is best for your wedding, be sure to get enough for all your tables as well as an extra box just in case your guest list enlarges and you will need an extra table. After you purchase your candles, it will be a good idea to check at your local dollar store for inexpensive floating candle bowls. Glass fish bowls work great as floating candle bowls because they are large enough to allow you to include marbles or flowers with your candle and still have plenty of room to float. your centerpiece look tacky. 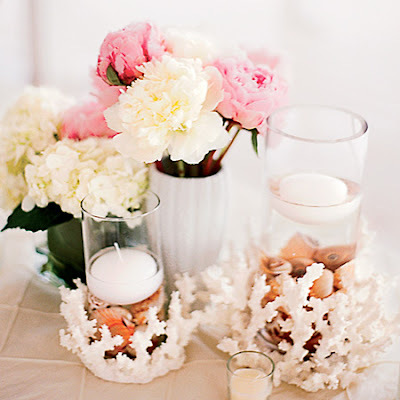 The cheapest way is to simply use flower petals in the glass bowls. Typically, five or six petals is all that is needed to cover the bottom of the bowl and then use a white floating candle on top to create a stunning centerpiece. If you wish to use whole flowers, make sure your glass bowl will be large enough then fill the bowl with enough water so that the flower will be completely submerged. The flower will look as if it is under the candle as it floats in the bowl. If you decide to use seashells in the bowls with the floating candles, be sure to use smaller shells which do not have large pieces so the candle does not get hung on it mid float. Once the candle is lit, it will create an eye catching luminescence which will reflect on the water and will make the shells appear bigger. For a more tropical look, add a few drops blue food coloring.